Director Lasse Hallström (The Shipping News, Chocolat) serves up a fluffy, romantic, period piece comedy centered around the antics of legendary lover Casanova in Venice. 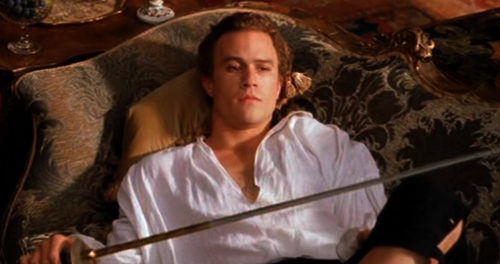 Heath Ledger plays the promiscuous hero, who early in the film receives a mandate from the ruler of Venice to get married or leave Venice forever. So Casanova goes in search of a wife, beginning a second act rife with mistaken identity and myriad characters trying to play musical chairs with would-be lovers. The problem I had with Casanova is that the lead character is a blank slate. We barely get a taste of his infamous reputation before the complicated plot takes hold, and Ledger never gets an opportunity to shine in the role. The film moves too quickly and contains too many characters, when it really would have benefited the audience to have a little more alone time with the main character — just enough to get emotionally invested in him. The Venice locations and costumes are all beautiful, and the supporting players are all familiar and comforting, if a bit predictably cast. Jeremy Irons representing the Inquisition is perhaps the most uninspired casting choice. Oliver Platt is always enjoyable in comic period pieces, but again — an unsurprising choice. Lena Olin and Natalie Dormer (Game of Thrones) also appear in the film. Sienna Miller probably has the juiciest role, one that shows more daring and bravery than Ledger’s. She plays a feminist author hiding behind a nom de plume who cross-dresses to crash all-male functions. Much could have been mined in her relationship with Ledger’s Casanova, but the film chooses instead to operate on a completely superficial level. The third act is the film’s best. It becomes reminiscent of an old Errol Flynn swashbuckler, with a dozen or so characters coming to Casanova’s aid just as he’s about to be hanged. If the whole film were as exciting as the last twenty minutes, I might have been able to overlook the shallow character treatments.